My response to the GunsAmerica‘s post on GunsAmerica Supports Interstate Tax Bill – 20 Points to Protect the 2nd Amendment, with slight grammatical corrections that don’t really affect the meaning. Sorry, I’m winding up a pitch to throw more than a few rotten tomatoes. Glad I’ve never done business with GunsAmerica. Now I know I probably never will. This post title is a lie. It has nothing to do with protecting the Second Amendment. It’s also a poorly crafted post. Others have pointed out contradictions. So how about another one: 7 and 15 contradict. Has an FFL as a “hobby” (7)? But I thought I couldn’t buy a gun from anyone who doesn’t have a brick and mortar gun dealer (15)? This is what we call disruptive technology. And in the long run it is a positive market force. You don’t see too many buggy whip vendors anymore, and for good reason. What GunsAmerica is supporting is for the state governments of all 50 states — with the backing of the federal government should this bill become law — to be a market force working against internet retailers. Note I said state governments. I have no problem with other businesses from all 50 states being in competition with a mom-and-pop internet gun retailer, but I do have a problem calling for more government interference in markets. The primary thinking behind the Second Amendment is as a bulwark against tyranny. I have, in the past, heavily criticized the NRA for there lack of the ‘long view’ and their sometimes (when it fits their narrative) claim that they are a ‘single issue’ organization. If you grade politicians strictly on their final votes on gun bills, you miss the big picture. Because sometimes these tyrants vote for pro-gun bills or against anti-gun bills only when they know they will have no chance in hell to pass (and they therefore got permission from their party leadership to vote against the party line). [Ed. – They are, hence, unreliable and two-faced.] Same goes for things that aren’t purely gun issues, but hugely, negatively affect liberty in general. There’s a strategic problem with this mentality. You see, as long as that tack is taken, you all but guarantee that our liberty will be progressively (heh) chipped away at until all we have left are our gun rights and then we will be forced into a corner and into using that right for its intended purpose. Do you really want that? DEFEND ALL LIBERTY. FIGHT TYRANNY ON ALL FRONTS. And let go of your short-sighted advocacy of government interference to protect your business. Instead, advocate tearing down all other infringements on our liberty. Methinks you might have just Zumboed yourself. I should also add a couple of points. First, as I’ve said elsewhere, credit where credit is due. The NRA has done a much better job this time around, probably spooked a little (in a good way) by the huge surge in membership after Sandy Hook. Good job, NRA. A hell of a lot better than the CCRKBA, this time around. Second, if GunsAmerica is unhappy about current circumstances, they need to be lobbying their state legislators to reduce or remove any state sales taxes in their own states. The last thing those of us fight for liberty need is someone purportedly on our side turning that fight into a Sisyphean task and pelting stones at us as we push forward, up the hill. Lastly, not only does single-issue vote scoring cloud where a politician really stands due to votes on bills guaranteed not to pass, but it also, usually misses other votes of importance that often don’t get graded. Oh, like, maybe voting fo Pelosi as for Speaker of the House, or to confirm Supreme Court Justices such as Kagan and Sotomayor. So GunsAmerica, stop it. Just stop. You’re not helping. I think I caught this article on FoxNews.com recently, but CATO just posted a link to it on Facebook. I’m mystified what’s going on at this supposedly libertarian institution. But then again, Libertarians (at least big ‘L’ libertarians) aren’t always that good on guns. Even John Stossel admitted that when he first considered himself a libertarian, he wasn’t really all that pro-gun. It’s odd to me that those who are supposedly for liberty and small government would have this kind of disconnect. I’ve got to wonder what that flip is going on with Cato, too. This isn’t the first time I’ve wondered. You don’t negotiate with terrorists. You don’t negotiate with the home invader. And you don’t negotiate with the gun grabbers, or anyone else threatening to restrict fundamental human rights. It has always been the case that those who cry ‘compromise’ mean nothing but that they will take just a wee bit less of our rights than they originally proposed. NFA, GCA, Hughes Amendment, AWB, Brady Act, etc, etc, bear that out. I will *never* have a so-called ‘cool head’ about this. ALL laws that even reference guns or weapons of military utility should be repealed, leaving only the Second Amendment. Prosecute violent offenders for malum in se crimes rather than creating so-called ‘criminals’ with malum prohibitum laws, no matter what means they use. And don’t sentence more harshly for the use of any weapons; you actually create a situation where killing someone with your bare hands is less egregious than using a tool. Why, exactly, is that okay? Under NO circumstances should any government entity know where, what, or how many guns the citizenry have. And I will use any means to further that goal. To quote one of the left’s favorite morons: “You go through the gate. If the gate’s closed, you go over the fence. If the fence is too high, we’ll pole vault in. If that doesn’t work, we’ll parachute in. But we’re going to get health care reform passed for the American people.” Well, Mrs. Pelousy, we won’t hesitate to use whatever tactics necessary to secure our liberty. Even though, despite the ranting and whining of the anti-rights cultists regarding this vote, all of this was done via regular order. You had your gawdfersakin vote. Now go home, back to the Oval Office Mr. President. You’ve got work to do. Like covering up Fast and Furious and the Benghazi fiasco. The national leadership of the NRA has been denying that they are in talks with Senator Manchin (D-WV) and others on a possible compromise regarding, in particular, Universal Background Checks. 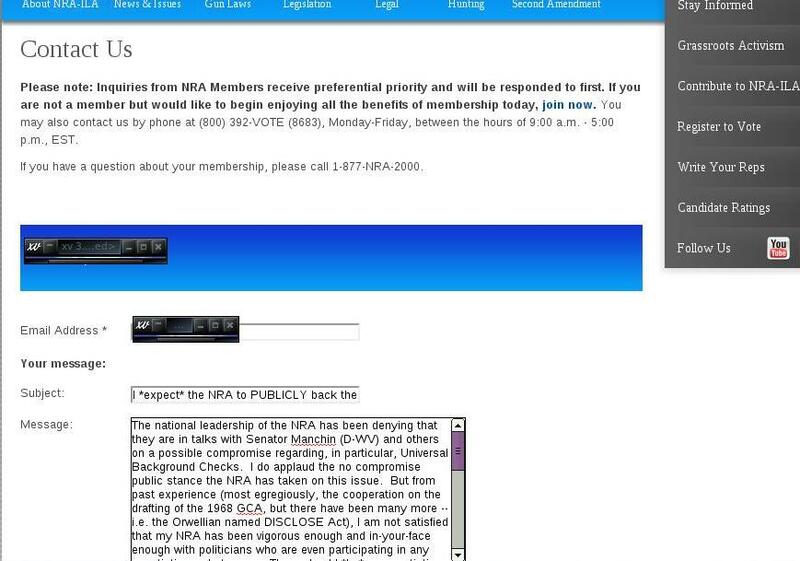 I do applaud the no compromise public stance the NRA has taken on this issue. But from past experience (most egregiously, the cooperation on the drafting of the 1968 GCA, but there have been many more — i.e. the Orwellian named DISCLOSE Act), I am not satisfied that my NRA has been vigorous enough and in-your-face enough with politicians who are even participating in any negotiations whatsoever. There should *be* no negotiation with ANYONE who wants ANY kind of gun control EVEN improvements to the current background check system. Mark my words: Any gun control whatsoever coming to the Senate floor will be a death knell for the Second Amendment. The NRA should be sending a message to all US Senators with a better NRA rating than ‘F’. That message should be that NOT supporting the Rand-Lee-Cruz (and reportedly, Rubio and Inhofe have added their voices) will affect your NRA rating negatively by at least one grade letter and will be cause for immediate loss of any subsequent endorsement. This is not a time for compromise and deal making, especially on the NRA’s part. As a life member, I expect you to make a public statement challenging all D or greater rated Senators that their grades will be downgraded and potential endorsements lost should they not back the filibuster.